Portages: Too many to count due to wood. 2-4 large waterfall portages. Shuttle: Shuttle takes about 35min at the end of the run. Put-In: Hillockburn Rd.- 30min. hike-in on a downhill trail. Take-Out: Pull off on the Clackamas River across from the confluence with the South Fork. 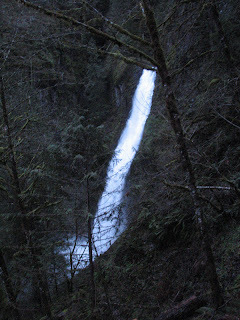 The Lower Falls (Mad Hatter Falls) still has wood in it, still un-runnable. Today I hiked into the Lower Falls (Mad Hatter Falls) on the S.F. 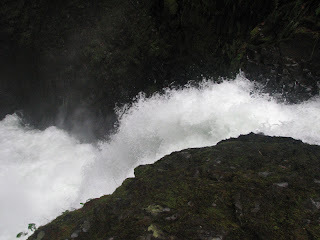 and saw 3 old-growth logs vertically wedged in the falls. It is going to take a major flood to remove those. 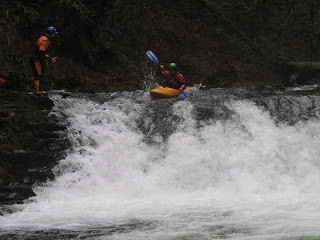 The Clackamas was flowing at 12,000 cfs. The S.F. 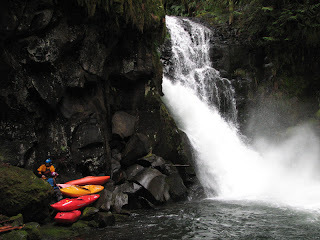 of the Clackamas River is rarely paddled and even seen for that matter. It’s often hard to notice the small trickle of the S.F. pouring in on the opposite side of hwy 224. This small trickle holds some interesting waterfalls and a big adventure! Good times on the S.F. of the Clackamas. We spent ALL day in that canyon and came out after dark. We found two 30 foot waterfalls, lots of class IV, one 120ftr, an awesome portage around that 120ftr through a tunnel, and more wood in this creek than any other I’ve ever been on! 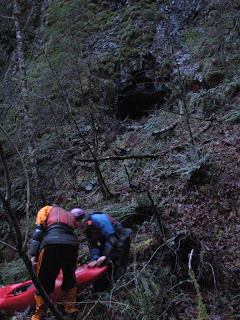 Once we finished the portage around the big falls the sun went down and we hiked the last 1/2 mile out in the dark passing by the last 60 foot waterfall (Mad Hatter Falls). Jason Schroeder on the 1.5 mile hike in. Nate & Heather Herbeck below the first 30ft. waterfall. Jason running one of the few class IV drops without wood in it. 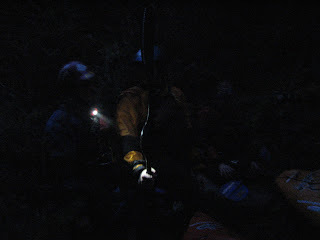 Collecting gear after the portage. The hole in the wall is the end of the tunnel we came out of. 1/2 mile from the take out in the dark. Take this run for what it is, a big adventure, and go see it for yourself if you are curious. Just pick a long day and move quickly. We moved quick, but none of us knew the run so we spent a lot of time figuring it out. The portages are challenging to get around, but throw and go options are there on the 30 footers. If your main goal it to huck some waterfalls, wait for the lower falls to clear out. 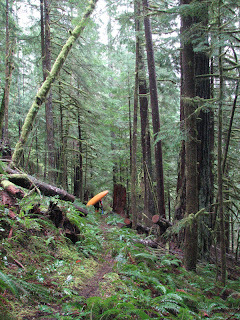 There are a couple challenging 30 foot waterfalls on the run, but there is a mass amount of wood between the waterfalls. There was 4,200 cfs on the Clackamas at Three Lynx gage this day which was a med/low flow for the South Fork.